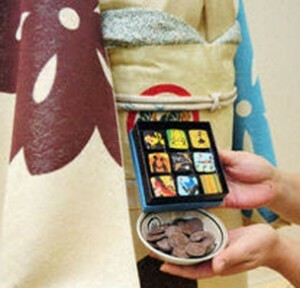 If you haven’t gotten your sweets fix after this weekend’s festivities, check out the world’s first chocolate kimono. New York-based chocolatier MarieBelle will reveal the kimono at its Kyoto store later this month. While not an edible or even cocoa-scented garment in its final form, the kimono is painted with a dye rich in white chocolate. “A sweet chocolate scent filled the air in the process of dying” said the wife of kimono designer Nobuaki Tomita. The kimono’s pattern features a brown and blue cherry blossom display on a beige background. Hungry for more? We don’t carry chocolate kimono at our Museum Store, but we offer the best of both. Pick up the classic sweet and salty Japanese treat, pocky, in chocolate, chocolate almond, and strawberry and get a peek at our stunning kimono collection. Sometimes, attention is unexpected… and really nice. Also in time for the holidays are Piperoids. Take the cartoonish neon looks of anime, throw in the robot-ish adventure of Transformers® and add the folding fun of origami, and you’ve got the newest toys to grace the shelves of the Morikami Museum Store. Sallie has added Piperoids – combination of “pipes” and “androids” – to the Morikami Museum’s wide selection of young-at-heart retail items for the 2009 holiday shopping season. The paper robot craft kits require just a pair of scissors for any one to make Japanese-style characters that battle each other. With names like Guyzer & Bean, Muscle Joe and Penk & Goriborg, the Piperoids are sold in a one-piece package for $12 and two-piece packages for $15. Check them out online at www.morikami.org. They are really cool, if you’re into brightly-colored, fold-em-up and play-with-them-for-hours type of stuff.